In a life of only 35 years, Wolfgang Amadeus Mozart created an extraordinary volume of memorable work that will be performed for as long as we appreciate the genius of timeless music. But who was Mozart really? And what path did he walk on his journey? Perhaps no one personified the cosmopolitan spirit of the Age of Enlightenment more than Wolfgang Amadeus Mozart. However, though he was celebrated in centers of culture, well known among the aristocracy, and honored for his musical compositions and performances, he often lived from commission to commission and remained somewhat dependent on his parents for financial support through most of his life. Mozart was alive during the American Revolution and the early stages of the French Revolution in the late 18th century. Despite this financial insecurity, Mozart embraced the artistic freedom to compose works of musical genius for a full 30 of his all-too-brief 35 years of life. Incorporating a broad array of genres and styles, his music gained lavish praise during his lifetime – and has received unparalleled accolades and even reverence in the two centuries since his death. Mozart was born in the independent “archbishopric” of Salzburg, in 1756. The city is situated at the northern edge of the Austrian Alps and today retains a provincial charm that continues to draw visitors from around the world both for the breathtaking beauty of the mountains and for the world-changing music that is central to its culture. Rather than receiving a conventional three-part name, Wolfgang was actually christened Joannes Chrysostomus Wolfgangus Theophilus Mozart. It was only years later during a sojourn in Paris that he playfully came up with another moniker in a somewhat exaggerated French-Latin style: Wolfgangus Amadeus Mozartus, which gently morphed into the name by which he has since been known by all. Wolfgang’s family was solidly middle class. His father, Leopold, was a musician and composer who was employed in service to the royal court of Salzburg. His mother, Anna Maria, came from a well-established family in the city. Because of the high infant mortality of the era, Wolfgang ended up as the sole male surviving progeny of the family. Though his mother had seven children, only two, Mozart and his sister Maria, nicknamed Nannerl, survived. The native language of Salzburg was German (as it is now), but young Mozart was comfortable communicating in all the predominant European languages of the day, including especially French and Italian – not to mention, of course, the universal language of music. Leopold Mozart, Wolfgang’s father, was a modestly successful but highly motivated court musician. He became deputy choirmaster in the court of Salzburg and provided private music lessons to the court’s children. 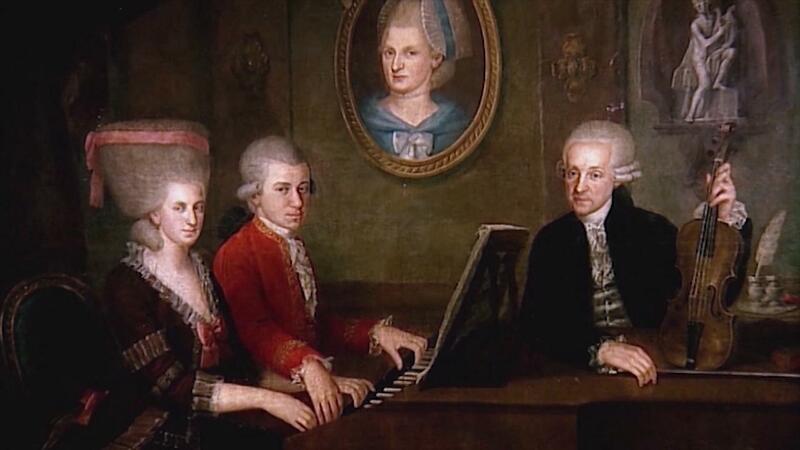 By all accounts, Leopold Mozart was actively involved in his children’s upbringing. Both Wolfgang and Nannerl were introduced to music from birth (perhaps even prenatally), and Leopold supervised their education throughout their childhoods. Wolfgang exhibited a genius for music from his earliest years, and his father was eager to share his son’s astonishing creativity and technical skill. Young Wolfgang played for the court of Salzburg from a time when he was barely old enough to read and write. He was gifted not only as a composer, but also as a multi-instrumentalist whose mastery of keyboards and string instruments soon became legendary. Mozart was just five years of age when he completed his first compositions, which were for harpsichord. Though each of the five pieces is short (generally less than a minute in duration), they are nonetheless works of maturity well beyond his tender age at the time. Filled with harmony, counterpoint, and the verve of music composed both for listening and dance, these pieces would stand proudly in any composer’s canon. For Mozart, however, these were just the beginning of an astoundingly prolific life of ever deepening complexity and mastery of his art. It was only natural for Leopold Mozart to want his precocious son to join him at the Salzburg court. As Wolfgang had already drawn the attention of the local cognoscenti, securing a position for him (even at the age of only 13) as assistant concertmaster of the court’s musicians was not an especially daunting task for his father. It would be Wolfgang’s first paying job, but not the last – not by a long shot. Wolfgang’s sister Nannerl also exhibited a facility for musical performance, and joined him and their father frequently on harpsichord for public performances. However, due to the conventions of the time, her destiny was quite different. Rather than being groomed for a lifetime as a music professional, she was encouraged to cease performing in her late teens in order to appear more home-oriented and therefore more marriageable. Eventually, Nannerl married and had children. If she wrote any musical compositions, they have all been lost. Perhaps unsurprisingly, young Mozart felt stultified by what seemed to him a confining role in provincial Salzburg. After all, he was already an internationally renowned composer, having been welcomed by kings and queens. And he made sure that his co-workers and employer were quite cognizant of his accomplishments. For his part, the Archbishop of Salzburg was as displeased with his contentious, quarrelsome underling as Wolfgang was unhappy with his duties. After much drama and several failed attempts to find work elsewhere, Leopold succeeded in having his son promoted to organist for the court. In 1781, a young woman named Constanze Weber caught Mozart’s eye – and he was smitten. At the time, Wolfgang was boarding in the home of the Weber family in Vienna. Constanze’s protective mother became aware that Wolfgang had taken more than a passing interest in her daughter and appeared to be courting her. Frau Weber was concerned by the potential impropriety of the budding relationship, and she asked Mozart to find lodging elsewhere. The setback did not seriously deter the young would-be lovers. No sooner had Wolfgang found another apartment than Constanze began spending as much time as possible with him there. So alarmed was Frau Weber that she threatened to send the police to retrieve her daughter. Mozart responded by marrying Constanze immediately (that day! ), thus legitimizing their relationship in accordance with the standards of the time. Despite his contemporary fame, Mozart was never in fact a wealthy man. He held a series of positions as performer and composer at a succession of royal courts in a variety of locales in Europe. In addition, he made money from commissions for his compositions, and was able (with some ongoing support from his father) to support his wife and children in the city he adopted as his own, Vienna. Mozart could have been a modestly well-to-do professional court musician and composer, following in the footsteps of his father (and, no doubt, outshining him). But Wolfgang was unsatisfied with the somewhat subservient lifestyle that was commonly expected in service to a single royal benefactor. So, he sacrificed the security of a court appointment for what we would call these days the life of a freelancer, or “independent contractor.” As those of us who have chosen that path have learned, there is a tradeoff between the workaday life of a wage earner and the potentially more creative – but less financially remunerative – life of an independent artist. Mozart made the most he could of an unconventional professional lifestyle and relied on contacts he had made earlier in his life for commissions and connections to compose and perform for fees. He also sold his music to publishers for income. And, as we know, he tapped his reliable and willing father for occasional financial support. In some ways, Mozart was flying without a net, taking on debt and then paying his creditors back when he was flush. It’s a credit to his musical genius that he was able to support his family, given his somewhat unsteady control of his finances. 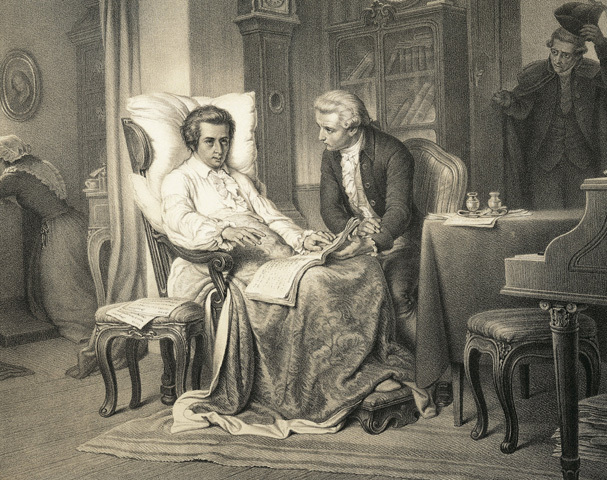 On December 5, 1791, Wolfgang Amadeus Mozart lay in bed struggling against his final illness. He had been hard at work in recent weeks on his ineffably majestic Requiem in D minor, and he asked for the score to be brought to him so that he might sketch out some ideas for its completion. A few hours later, he was dead. The particulars of Mozart’s demise are, even now, little known and highly disputed. Did he succumb to a sudden malady? Or did his illness persist over a long period, gradually worsening, and agonizingly “painful unto death”? Or, more salaciously, was he murdered by an envious rival who somehow slipped him a dose (or doses) of poison? Mozart’s family (and particularly his wife Constanze) were quick to promote a romanticized account of his death. He had expired slowly, they reported, filled with premonitory grief and dread at the prospect of departing this vale of tears. The problem with the family’s account of Mozart’s death is that – while widespread and rather popular in the public imagination – there is much factual, documentary evidence to the contrary. To be sure, Mozart had spates of illnesses over the course of 1791, but his private correspondence from the period indicates that he was jolly, full of love for life, and easily shared those sentiments with those around him. Nearly up to his death he communicated frequently with those close to him and betrayed no gloom or fear of his mortal fate. So, what killed Mozart? We know he was feverish, and his body was swollen and marked by small bumps all over his skin. He was racked with pain and found it hard to move. A doctor was summoned, and he ordered cool compresses for Wolfgang’s forehead. But, when the compresses were applied, it seems that his body went into shock, and he fell into a coma. He died soon thereafter. A Pauper’s Funeral for the Great Mozart? Misunderstandings about the nature of death and burial rites in late 18th century Vienna have led to misconceptions regarding Mozart’s final resting place. There are those who believe that he received a pauper’s funeral and was buried in an unmarked grave, but he was certainly not truly a pauper at the time of his death. In fact, although he still had significant debts, 1791 had been one of the most financially successful years of his life. It is true that he was wrapped in a plain linen shroud and placed into what was called a “common grave” marked with a simple wooden cross. But this was standard practice for everyone other than members of the aristocracy, and “common grave” merely means that he was not of royal blood. After his death, Mozart’s widow Constanze was so financially strapped that she had to appeal to the emperor of Austria for support. Although Mozart died leaving significant debts, he was held in such high regard by the court that Constanze was granted a pension. In fact, it was not only the court that held him in high esteem. At the time of his death, and ever since, his music has been as beloved as any composer’s. According to VAN Magazine, which covers contemporary, classical, and early music, more of Mozart’s works (20) are in the standard repertory of contemporary orchestras than any other classical composer, with runner-up going to works by Beethoven (14). Mozart’s mastery of musical form – operas, concertos, string quartets, symphonies, chamber music, and so much more – has made him not only one of the great composers of all time, but also one of the most influential. For over two centuries he has been the subject of adulation, influence, even imitation. And, like all great artists, he lives on through the many ways his music continues to enthrall his listeners.